Anub'rekhan is considered the second easiest boss in Naxxramas (Noth the Plaguebringer being the easiest), and this is for the most part true. His fight is simple to understand, he has only a few abilities, and almost all of them are completely ignorable if you have good gear or skilled players in your group. Impale - Anub'Rekhan will target a random player and send a line of spikes out towards the player, hitting everyone in a straight line between him and his target. Players hit by these spikes will take 4,813 to 6,187 (25 Player: 5,688 to 7,312) physical damage and will be knocked into the air, suffering reduced fall damage when they land. This means that throughout the entire fight, Anub'rekhan will be able to shoot a line of spikes towards one player in the raid, and anyone caught in between him and that player will be hit by the spikes. These don't do enough damage to be a serious problem, but they will interrupt spellcasting and the damage it deals can be easily reduced by spreading out just a bit so that you aren't standing in a straight line in front of other people. Locust Swarm - Every 80-120 seconds Anub'Rekhan will release a locust swarm that damages players within 30 yards around him and applies a stacking Locust Swarm that deals 875 to 1,125 (25 Player: 1,313 to 1,687) Nature damage every 2 sec. While the spell is active, Anub'Rekhan will move at 60% (25 Player: 75%) of his normal movement speed. Any players afflicted by the Locust Swarm will be pacified and unable to use spells or attack for the duration of the effect. A Crypt Guard will spawn immediately after Locust Swarm is cast. This is the ability that makes Anub'Rekhan dangerous. 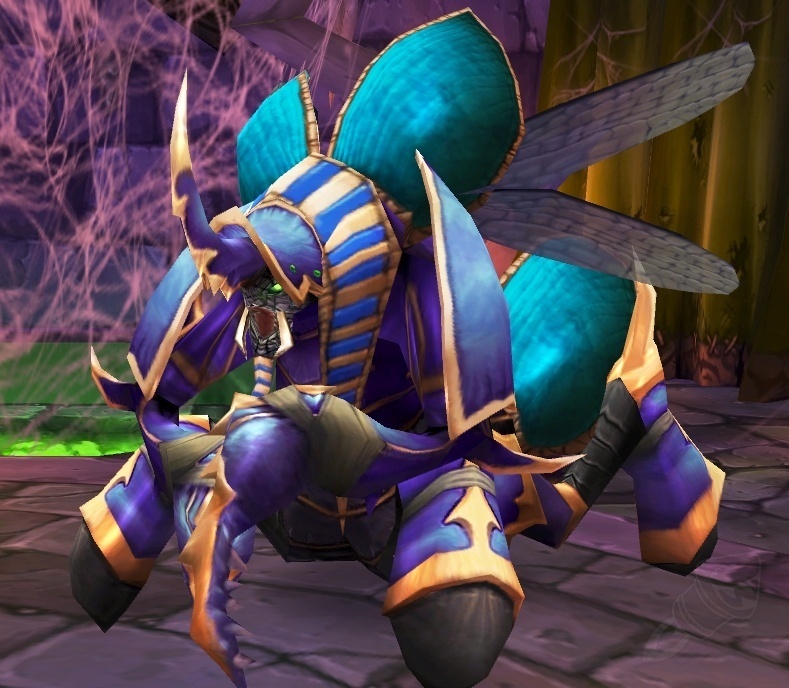 every 80-120 seconds, Anub'Rekhan will start casting a spell, and a raid warning will come up on the screen warning you that he's casting Locust Swarm. When it finishes, Everyone within a 30-yard radius of Anub'Rekhan will be completely silenced, unable to even auto-attack, will be taking a stacking DoT that will hit hard as the stack increases, and will have their movement speed slowed down considerably. Your first priority for this ability should be to attempt to pre-empt it. If you have a timer or mod that can tell when he is likely to use it, announce it a few seconds ahead of time so you can pull out faster. All Melee should pull back into the green circle in the middle of the room for safety, and wait there until the effect ends. 1) If your group is well-geared enough, skilled enough, or your healers and tank are exceptional, you can have the Tank sit in the locust swarm and hold Anub'Rekhan where he is, just taking the DoT and having your healers heal through it. While this is dangerous for lesser-geared groups, it is much faster and effecient for those who can do it. 2) For lesser geared groups, a much more common method is having your tank turn as soon as Locust swarm is being cast, and run along the edges of the room, having Anub'Rekhan chase them. It is very important that your tank does not dip into the green goo here, as it will reduce their health by more than half. Speed boost abilites such as aspect of the pack are useful here, but you must be careful to make sure Anub'Rekhan is still following the tank and won't cut across the DPS and Healers, and that if the Tank gets hit by Locust Swarm accidentally, it will slow him down even more. When you reach the opposite side of the room (The door you entered from, or the door that Anub'Rekhan was in front of), the Tank stops and DPS re-organizes themselves to fight Anub'Rekhan on that side of the room. Summon Crypt Guard - Anub'rekhan will periodically summon Crypt Guards after his Locust Swarm. These Crypt Guards will apply a stacking debuff to their target, which will reduce their armor by a large amount. The Crypt Guards will be hard to miss, as they're just a little smaller than Anub'Rekhan himself. When a Crypt Guard spawns, the Offtank in the group should pick him up, and depending on your group's makeup, gear, and skill, you should have all DPS or ranged DPS turn and kill the Crypt Guard before focusing back on Anub'Rekhan. A Crypt Guard will be summoned immediately after Locust Swarm ends, so your offtank should be prepared. Summon Corpse Scarabs - Anub'Rekhan will use this ability to summon Corpse Scarabs from the bodies of dead Crypt Guards (10 per) and players (5 per). This should be a minor annoyance at best. Whenever any player corpse or Crypt Guard corpse is on the ground, Anub'Rekhan will be able to summon some tiny Scarabs that will go and attack random raid members. These should be AoE'd down if they're a problem, or ignored otherwise. The only real damage they cause is from swarming too many of them (If you ignore them too long, or are unlucky with the corpses in the room) or their slowing your casters' spells. 5 Scarabs will be summoned from a player corpse, and 10 from a Crypt Guard corpse. Your group should decide which door you'll be tanking Anub'Rekhan from. Either works, but most generally pull him to the entrance as it is faster than running up to his door. Your ranged and healers should group up in the green circle in the middle of the room, or as close as they can get to it while still staying within range of the boss. They're much safer here, as they don't have to pull out of Locust Swarm. Melee should be prepared to run back to the circle on command. The Tank should be ready as well for whatever your group decided on, running or eating the debuff. If you plan to eat the debuff, it may be useful to blow defensive or survival cooldowns as Anub'Rekhan is casting his Locust Swarm, because you'll be silenced if otherwise. Everyone should make a small effort to not stand in a line with others, but it should not be a priority and can be ignored most of the time. When a Crypt Guard is spawned after Locust Swarm, your Offtank should pick it up and DPS should switch to it (Ranged only, if you have agreeable makeup, gear, and skill). After the Crypt Guard dies, be ready for Crypt Scarabs and attempt to AoE them down, but only focus fire them if they become a problem. Ranged DPS can continue to damage Anub'Rekhan during Locust Swarm, but it's important that the Tank holds aggro, or Anub'Rekhan will charge the raid in the middle, and wipe the raid.